Born on November 5, 1715, Giacomo Amoroso followed the trade of his father, a shoemaker. As a lad, he held the greatest horror of any sin at all. At his work, he distinguished himself by great modesty, docility, industry, and patience. When his parents died, he applied at the Capuchin convent for admission. He was refused. He persevered and he prayed, waited, and at opportune times renewed his plea again and again. Finally, after eight years, at the age of twenty-seven, he gained admission. 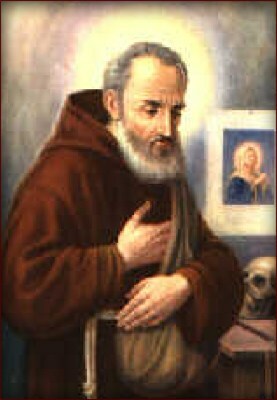 On October 19, 1743, at Mistretta, he was invested with the habit and the name Felix after the first saint of the Order. Upon his profession, a year later, he was recalled to Nicosia to assist the questing brother in his mendicant rounds. Like his Seraphic Father, Saint Francis, Felix was very austere on himself in private but publicly his love of God was expressed itself in charity towards his neighbor. Like Francis, he had a great love and devotion to the Blessed Sacrament. He was endowed with the gift of healing temporal and spiritual diseases and he delighted in tending the sick. He could also bi-locate in the same way as Padre Pio. Called to aid the sick when a malignant epidemic was decimating Cerami in March 1777, he responded eagerly. Airlessly and indefatigably, he went about ministering to the sick, and his labors were crowned with abundant success. "So be it for the Love of God," were the words with which he accompanied his miracles of healing, and for the love of God he may be said to have lived his whole life. Second, only to love, came obedience. He never did anything without permission, and when he was overtaken by his last illness, he asked the guardian to give him leave to die. He passed away on May 31, 1787, at the age of seventy-two. For thirty-three years, he lived under a superior who considered it his role to sanctify Felix by subjecting him to relentless severity and fantastic humiliations, all of which he heroically endured. Felix was beatified by Leo XIII, on February 12, 1888. Three years later, his remains were transferred to the Cathedral of Nicosia.